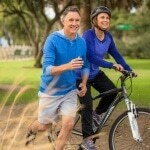 An Australian study published in Cell Metabolism (Jan. 2018) hypothesized that the cells communicate with each other in response to physical activity. Vesicles, tiny protein-filled packages, “contain genetic material and proteins that carry messages to other parts” of the body that all have connections to the liver. When subjects cycled for about an hour, there was an increase of 300 ‘message-carrying proteins’ compared to the number in non-exercisers. A Mayo Clinic study of 72 volunteers under 30 and over the age of 64 were divided into 4 groups: weight training, intervals on real bikes, moderate stationary cycling for 30 minutes with light weight lifting on alternate days. Intervals boosted gene activity for those under 30 by 274 genes; for those over 64 it gave them a nearly 400 genes boost! These results led to the conclusion that intense exercise corrects cellular aging. Finally Penn State researchers found that strength training twice a week for 5 years reduced the odds of dying during the next 15 years! FIFTEEN years of extra life for only 2 hours/week. That is, it conferred a protective benefit against cardiac and cancer deaths beyond what strength and physical function you’d expect. In light of a new though not formally recognized finding of a new organ – the interstitium, a liquid-filled sac between cells – it may just be that exercise is the high-speed network between cells that reduces cellular aging and increases life expectancy. For more on the genetics of fitness and health, read other blog posts here, here, and here. 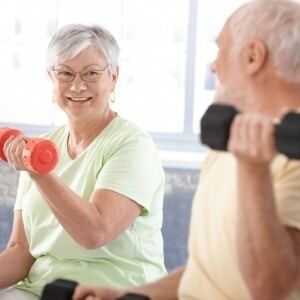 Sarcopenia = loss of muscle mass due to aging. After 30, on average, we lose 8% – 10%/decade of our muscle mass. Likely the combined result of disuse, neurobiology and physiology, this predisposes us after the age of 60 to a variety of lifestyle risks for obesity, heart disease, fragile bones, instability and falls. Resistance training (RT) has been shown beneficial in reducing the rate of muscle loss if it’s sufficiently strenuous enough so long as it does not cause muscle monotony or soreness. 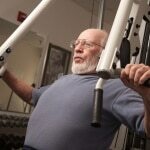 We’ve written about the benefits of RT for older folks here, here,and here, but not specifically about whether and what kind of training program works to minimize soreness and tedium. Periodization – dividing a workout program into progressive blocks with built-in rest phases – works well for young athletes; does it work for older adults? A study reported on a 22-week, 3/week RT program for 3 different groups of older subjects: NP (not periodized), BP (block periodized) and UN (undulating, daily periodized) training. Other studies have demonstrated that older adults may not need to periodize to see health benefits. This study’s hypothesis, however, was that BP and UN would enhance the gains and the overall experience of the subjects. 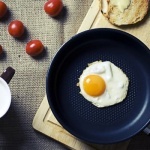 A Spanish study of more than 4000 adults, categorized into 3 groups – breakfast eaters, non-eaters, and light eaters – found that ~75% of non-eaters had signs of plaque build-up in their arteries vs only 57% of eaters; 64% of light eaters had arterial plaque build-up. Does standing more at work burn enough calories to matter? There are a variety of benefits to standing compared to sitting: blood sugar and blood pressure regulation come to mind. But weight management? That’s hardly been studied. The Harvard Women’s Health Watch (Apr. 2018) reports on a study that found a 60 Kg person might burn only 54 an extra calories/day. But that’s about 5 lbs/year – or 20 lbs in 4 years! Got GERD? Reflux can damage the esophagus leading to a Barrett’s esophagus, a potential precursor to cancer. Most people start a regimen of PPIs or other antacids to manage reflux and protect the esophagus and stomach. Tufts’ Health & Nutrition Letter (Apr. 2018) reports on a review in the Current Opinion in Gastroenterology that there are no “absolute triggers” to reflux, but that lifestyle matters – a lot: losing weight and making better choices in diet – how much and what kinds of food triggers you have, as well as moderate alcohol use help manage GERD.